The Activity Desk Expansion Pack 4-in-1 Pre-Kindergarten Expansion Pack Bundle comes with four expansion packs intended for ages 2-4: Numbers & Shapes, Get Ready for Preschool, Nursery Rhymes, and Animals, Bugs & Critters. 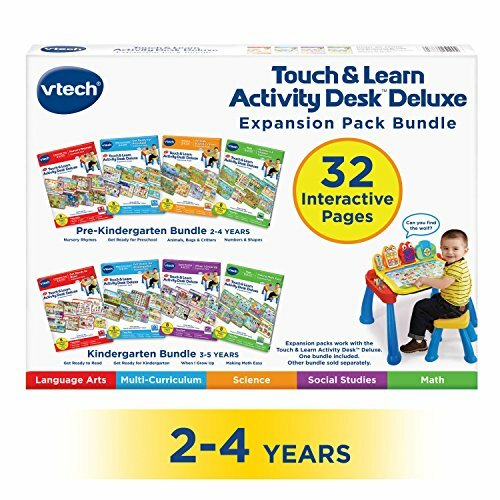 Each expansion pack includes a cartridge and four colorful double-sided activity pages, which is for use with the VTech Touch and Learn Activity Desk Deluxe and the Explore & Write Activity Desk (each sold separately). Durable cards easily wipe clean and will not tear!